October 2018 through February 2019, Tuesdays, 8:30 a.m. Prospective SES Students and their Parents are invited to tour SES. Mr. Hays, our Principal, and Mr. Bohman, will be conducting school tours every Tuesday, October through February, at 8:30 a.m. Please meet us in the office. We look forward to meeting you and showcasing our award winning school! Check out this weeks Community Bulletin by clicking the link to the right. See attached pdf flyer for details. The SES PTSA will hold a General Assembly Meeting on March 27th, 2019 @6:30pm. 9th Grade Museum 2019 – You’re Invited! The museum design challenge this year features 21 bridges from around the world! All members of the SES community are invited to come and check it out. Check out our latest promotional video by clicking the link below! As part of a feature story on innovative approaches to education in California, Forbes.com published a story that prominently featured the school and Gabriela Vargas, a member of the Class of 2016. In particular, the article highlighted how schools like SES prepare students for success in college and career by helping them develop real world skills. You can check out the article below. Congratulations Gaby! WASC visit and Report information! SES just completed its mid-cycle review by the Western Association for Schools and Colleges (WASC). Thank you to all the staff, students, and parents that participated in our successful review!! Check out the results of our review! 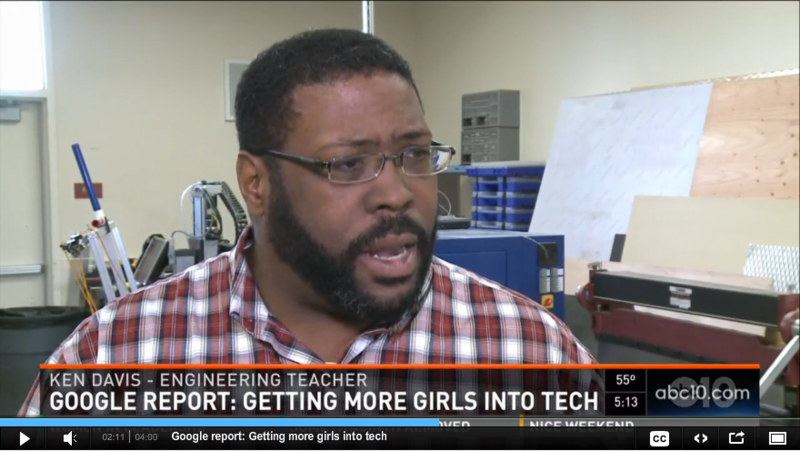 Senior Gabriela Vargas and Lead Engineering Teacher Ken Davis were featured in a recent News 10 story about the need to generate more diversity in Engineering and Science related fields. Gaby and Mr. Davis spoke about the work they and the school are doing to increase the number of women and minority in STEM. You can check out the clip by following the link below! SES Featured in TV Series on Deeper Learning! SES students and teachers were the focus of a series of TV episodes highlighting new and exciting instruction taking place across the United States. Each episode highlights a different aspect of the innovative approach at SES including closing the STEM gender gap, the Linked Learning approach, and bringing industry into the classroom. Many SES students made the trip to Kennedy High School Sunday to check out the annual SCUSD college fair. The gym was packed with students and college recruiters eager to get to know one another. SES students from grades 9 through 12 were in the mix picking up flyers and filling out interest forms! 7th Graders Code Their Way to Victory at CSTEM Day! Congratulations to all our 7th grade students who participated in the annual CSTEM Day competition at UC Davis! A special shout out to Max, Melanie, and Pa Dong for their 1st place finish in Pre-Algebra Programming! 3D Printing and Programming by SES Students! SES prides itself on being a place where students learn by doing. A great example of this can be found in the video below. Several of our students programmed small robots, known as LinkBots, and linked them together with innovating 3D printed parts they designed themselves. This was part of their culminating project in our school’s unique Advanced Programming course that was developed in partnership with UC Davis’ C-STEM Center. SES Wins Big at the SMUD Solar Regatta! The Class of 2015 came back from the SMUD Solar Regatta competition with 2 trophies, one for Best Technical Design and one for Spirit. Check us out on Twitter or Facebook! The Middle School Science Night was a tremendous success! We would like to thank our partners at the California Air Resources Board and the Society of Women Engineers for judging projects and mentoring students. Of course, none of this would have been possible without the support and enthusiasm of SES teachers, parents, and students. Great work! If you’d like to check out some photos of the event, please click here. Congratulations to SES Senior Kristin Wong for her oustanding presentation at the Sutter Club on October…. Kristin was asked to speak to a packed audience of VIPs from education and industry including Senator Pro Tem Darrell Steinberg, Chancellor Brian King, and President Alex Gonzalez. Partners – How can you get involved? The quad is all ready for students! Want to know what makes SES different than other schools? Check out this video created by Sal Angrisani, SES Class of 2013. See the link below for teacher tutoring schedules. Click here for the SES Tutoring Schedule! Starting in the Fall of 2017 the California Scholastic Federation-Sac Joaquin Section (CIF-SJS) will no longer honor the SCUSD Multi-Schools Athletic Participation Agreement that has been in place for the last 4 years.